“The history of six thousand years of evil has been lost on man. He refuses to read its awful lesson regarding sin, and God’s displeasure against the sinner, which that history records. The flood of evil that has issued forth from one single sin he has forgotten. 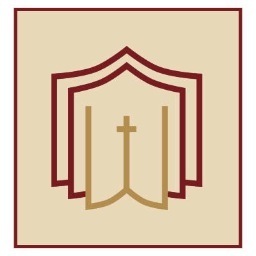 The death, the darkness, the sorrow, the sickness, the tears, the weariness, the madness, the confusion, the bloodshed, the furious hatred between man and man, making earth a suburb of hell,—all this is overlooked or misread; and man repels the thought that sin is crime, which God hates with an infinite hate, and which He, in His righteousness, must condemn and avenge. If sin is such a surface thing, such a trifle, as men deem it, what is the significance of this long sad story? Do earth’s ten thousand graveyards, where human love lies buried, tell no darker tale? Do the millions upon millions of broken hearts and heavy eyes say that sin is but a trifle? Does the moaning of the hospital or the carnage of the battlefield, the blood-stained sword, and the death-dealing artillery, proclaim that sin is a mere casualty, and the human heart the seat of goodness after all? –Horatius Bonar, The Everlasting Righteousness; or, How Shall a Man be Just with God? (Carlisle, Pa.: Banner of Truth, 1874/1993), 9-10. “I had a vision of him on the stretcher, opening his mouth voraciously, as if to devour all the earth with all its mankind. He lived then before me; he lived as much as he had ever lived—a shadow insatiable of splendid appearances, of frightful realities; a shadow darker than the shadow of the night, and draped nobly in the folds of a gorgeous eloquence. The vision seemed to enter the house with me—the stretcher, the phantom-bearers, the wild crowd of obedient worshippers, the gloom of the forests, the glitter of the reach between the murky bends, the beat of the drum, regular and muffled like the beating of a heart—the heart of a conquering darkness. It was a moment of triumph for the wilderness, an invading and vengeful rush which, it seemed to me, I would have to keep back alone for the salvation of another soul. And the memory of what I had heard him say afar there, with the horned shapes stirring at my back, in the glow of fires, within the patient woods, those broken phrases came back to me, were heard again in their ominous and terrifying simplicity. –Joseph Conrad, Heart of Darkness (New York: Penguin Books, 1899/2007), 91-2. On February 14, 1990, NASA commanded the Voyager 1 spacecraft, having completed its primary mission, to turn around and photograph planet Earth from nearly 4 billion miles away. Caught in the center of scattered light rays from the Sun, planet Earth appears as a tiny point of light, a crescent only 0.12 pixel in size. 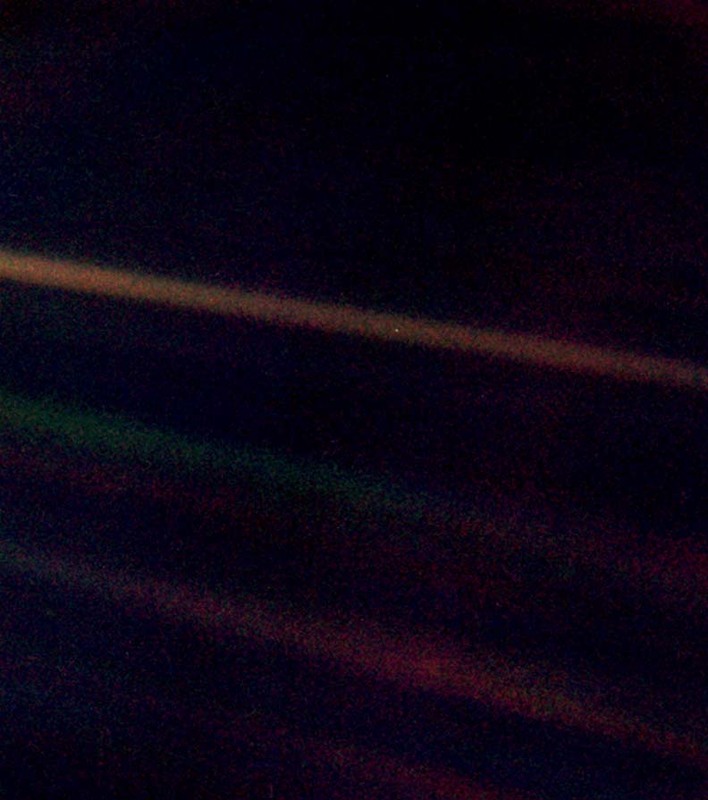 This grainy photo of Earth has become known as the "pale blue dot." “Look again at that dot. That’s here. That’s home. That’s us. On it everyone you love, everyone you know, everyone you have ever heard of, every human being who ever was, lived out their lives. The aggregate of our joy and suffering, thousands of confident religions, ideologies, and economic doctrines, every hunter and forager, every hero and coward, every creator and destroyer of civilization, every king and peasant, every young couple in love, every mother and father, hopeful child, inventor and explorer, every teacher of morals, every corrupt politician, every ‘superstar,’ every ‘supreme leader,’ every saint and sinner in the history of our species lived here– on a mote of dust suspended in a sunbeam. The Earth is a very small stage in a vast cosmic arena. Think of the rivers of blood spilled by all those generals and emperors so that, in glory and triumph, they could become momentary masters of a fraction of a dot. Think of the endless cruelties visited by the inhabitants of one corner of this pixel on that scarcely distinguishable inhabitants of some other corner, how frequent their misunderstandings, how eager they are to kill one another, how fervent their hatreds. –Carl Sagan, Pale Blue Dot: A Vision of the Human Future in Space (New York: Random House, 1994), 6-7.